I am officially obsessed with my Vega beret. The project began with a bit of trepidation: first the mathy acrobatics involved in getting gauge. I always need to go up a needle size for everything (use a 6? ), but ribbing is usually knitted on needles 1 size smaller than the body of the project (use a 5! ), but the ribbing on Vega is rawther snug to begin with (5 not working! ), so I ended up going up to a size 6 needle. With size 6 needles, the yarn finally felt right, so I sped through the ribbing with renewed confidence. Then it was time for the Fair Isle. 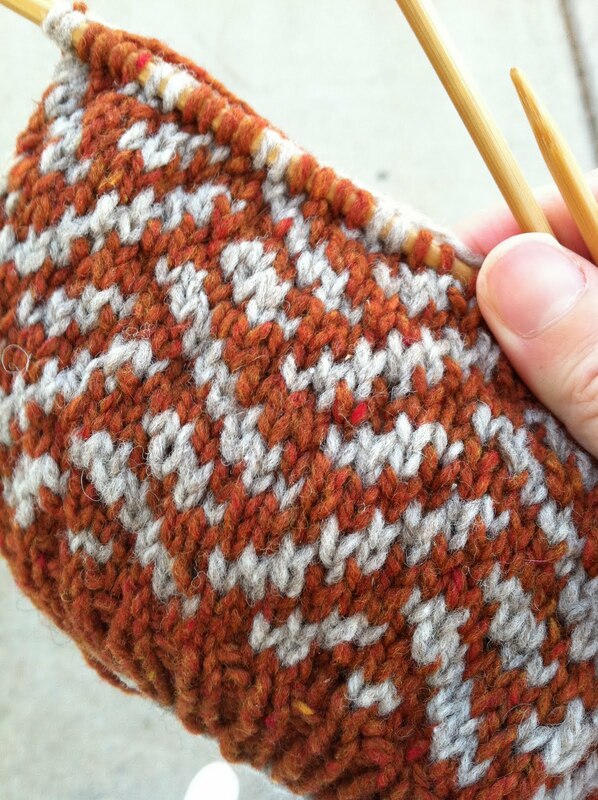 I will admit, it had not occurred to me until that point that I don’t really do colorwork. A quick scroll through the blog archives will bear this out: I am largely a monochrome knitter, with occasional forays into (gasp!) striping. So I stared at the pattern’s little Fair Isle chart for a minute, wondered whether I should hit Google, and then remembered: I am me. Every single knitting technique I know I have learned from a combination of reading books & articles and ample fudging. Some time, in the distant past, I had done Fair Isle. I thought about it and sort of began to remember. Then I fudged the rest, and amazingly, my hat is looking quite a lot like the ones in Jared Flood’s pictures. And I simply adore it.